A beautiful design by Canadian artist, Elena Khomoutova. 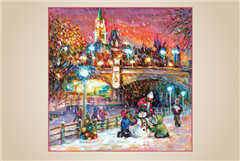 This Holiday Greeting Card shows the Rideau Canal in Ottawa in all its Christmas glory. Anybody would be thrilled to receive this stunning Holiday Greeting Card. © 2006-2018 Attitude Greetings Inc., All rights reserved. Charity Cards and CharityCards.ca are trademarks of Attitude Greetings Inc.
All other product, brand and company names and logos used on the site are the trademarks of their respective owners.